© Artists Rights Society (ARS), New York, New York/VG Bild-Kunst, Bonn, Germany. Photograph by John Seyfried. 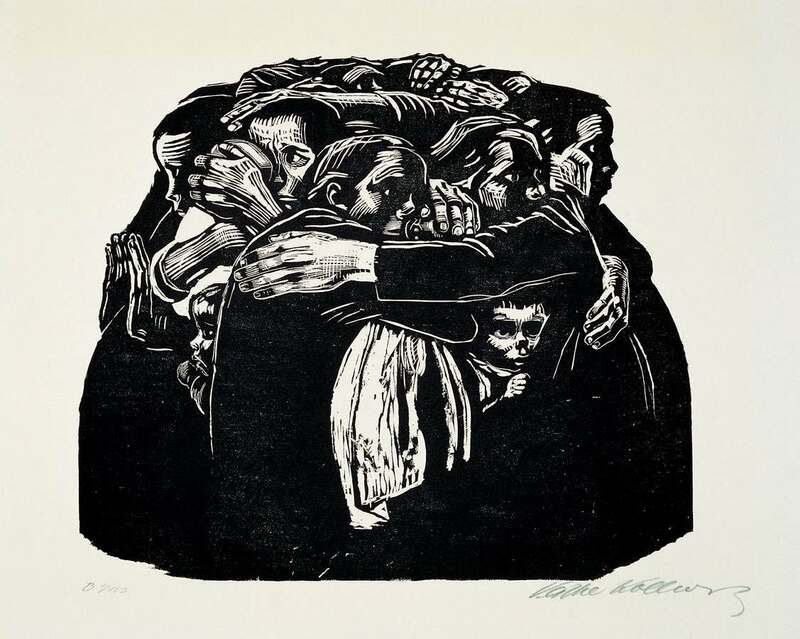 Following the catastrophe of World War I, German artist Käthe Kollwitz produced a portfolio of seven woodcuts entitled War in 1923 at the height of the pacifist movement in Germany. Using generalized figures of mothers, widows, young soldier volunteers and grieving parents, the prints focused on the pain and sorrow of those left behind. Kollwitz was particularly sensitive to the grief of mothers, having lost her own son Peter in the early months of the war. The Mothers, part of the War portfolio, shows a group of women locked into a solid sculptural mass that forms a protective barrier for the infant held by one and the two children who peer out between their mothers’ skirts. Though implying that mothers will stand together to prevent their children from marching off to future wars, the women are defensive and anxious. The woodcut evokes the sacrifice and suffering of German mothers who sent their sons off to war for their country’s honor and now fear losing the flower of the next generation to future militarist adventures.